Cora Franchise Group, Inc., Canada’s breakfast leader is proud to announce the opening of a new Cora restaurant in Peterborough, Ontario. The new restaurant located at 815 High Street, Peterborough, welcomed its first guests today, Monday, October 29, 2012. An official Grand Opening ceremony will take place on Wednesday November 7th at 10:30 a.m. The Cora team along with Founder Cora Tsouflidou, Executive Vice President David Polny and local owner-franchisee Florence Kelly will proudly welcome local dignitaries, special guests, and the Peterborough community for a true Cora-like celebration that will feature the symbolic cracking of eggs for the first omelette officially created in the restaurant. 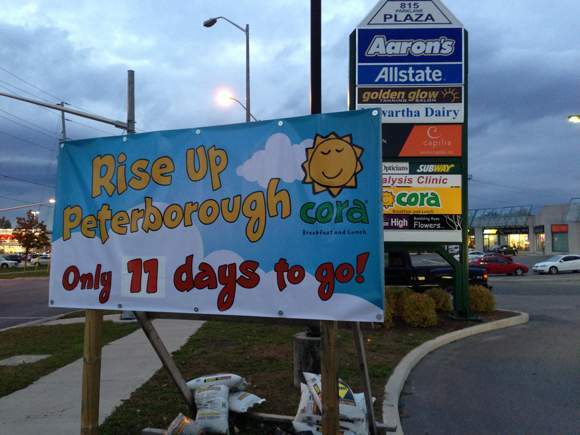 The Peterborough location is part of a nationwide expansion of the Cora network, making it its first in Peterborough, the 45th in Ontario, and the 130th in the country. Cora is now the largest sit down breakfast operation in Canada and the chain’s growth will continue, as many more openings are scheduled for the months to come. On Sunday October 28th, the location held a special friends and family day where all proceeds raised will be donated to the YMCA Strong Kids Campaign. The donated amount will be presented during the Grand opening celebration on Wednesday November 7th. Madame Cora originated the concept in 1987 when, as a single mother of three in need of a career, she bought a small abandoned diner on Côte-Vertu Boulevard in Montreal’s St-Laurent area focusing solely on breakfasts: fresh fruit, cheese, cereal, omelettes, crepes and French toast. The restaurant quickly became the talk of the town, often having line ups to get in. Madame Cora’s astute entrepreneurial instincts told her that this was a concept that could be franchised. The Cora restaurant chain is famous for its all-day breakfast fare that boasts mounds of fresh fruit artfully prepared by on-site specially-trained “fruiters”. Over the years, inspired by family traditions, health trends, customer requests and suggestions from her children, Cora has conjured up more than 100 menu ideas; most of which still today bear the names of the customers or family members who inspired her. Cora Breakfast and Lunch offers customers quality food and service in a cozy family setting Monday to Saturday from 6:00 a.m. to 3:00 p.m. and on Sunday from 7:00 a.m. to 3:00 p.m. 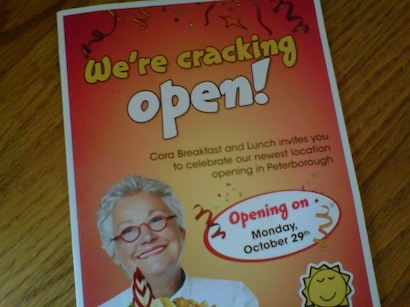 The much anticipated breakfast/brunch hotspot Cora will be opening soon in Peterborough, on Monday, October 29th. For those of you who have never experienced a trip to Cora, you only have a few more days to wait! It is located at 815 High Street, across from Lansdowne Place (705.741.4500).